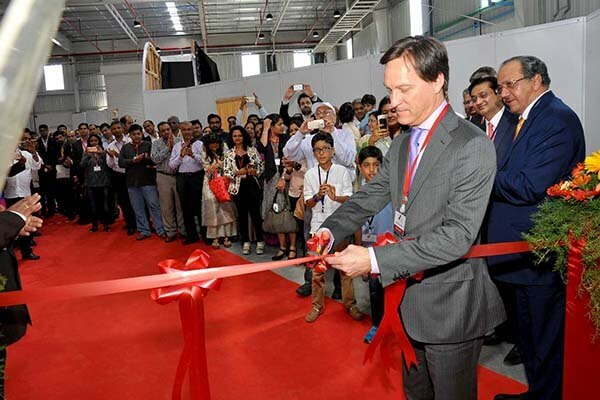 Sri City, February 24, 2016:- Mumbai based Parksons Packaging, one of India’s leading manufacturers and exporters of printed and laminated folding cartons, inaugurated a new folding carton plant in Sri City on Friday. a German manufacturer of precision offset printers are the technical partners of Parksons. Welcoming the guests, Mr. Ramesh Kejriwal said that their strategy was to continuously expand their geographical reach. He described that Sri City plant inauguration makes Parksons a confluence (sangam) of West, North and South, as they have units in these regions of the country. Commenting on the occasion Mr. Ravindra Sannareddy, Founder Managing Director, Sri City said,”Parksons Packaging being one of the leading packaging solutions providers in the country, focusing on constantly driving innovation, it is preferred across the industries in different sectors.We are confident that its presence creates a symbiotic ecosystem in Sri City, which is the home for Food Processing & Beverage industries, FMCGs and other manufacturing industries in different sectors. Mr. Jean Pacal Bobst and Mr. Stephen Plenz have also addressed the gathering and conveyed their wishes to the Parksons family. The greenfield plant in Sri City that produces and processes folding cartons was built in a ten-acre parcel of land and the first phase of investment of Rs.70 crores houses the best in class technology from Heidelberg and Bobst among others, and was completely equipped to provide end to end solution to all our customers. The plant will provide employment opportunity for about 200 persons. Currently from its four state-of-the-art manufacturing units across India—one each in Daman and Chakan (Pune) and two in Pantnagar (Uttarakhand)—Parksons manufactures 10 million packs daily for its clients. Next month their sixth unit will be inaugurated in Guwahati. Pharmaceuticals, Ranbaxy and many more. Parksons revenues jumped nearly ten-fold to Rs 476 crore in FY2015 from Rs 57 crore in 2005, and branded packaging for FMCG and white goods firms account for about 70 percent of its revenues.